This hairpipe breastplate choker (shown in cherry) is accented with glass crow beads and solid brass beads. The centerpiece is a 3" abalone disc with blue and beige glass crow bead fringes. There are many long brown buckskin fringes along the sides and the neckties are also authentic buckskin. 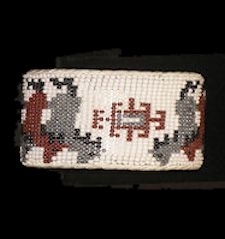 Read the artist's bio and see more work by Lenape / Pocumtuck artist Robert TwinEagle.